It is the season of celebrities joining Facebook! After Dr. Abdul Kalam and Amitabh Bachchan, India’s greatest cricketer Sachin Tendulkar has joined the world’s largest social network. I’d like to welcome you to my facebook family. As a child I always dreamt of playing cricket for India and I chased my dream of winning the World Cup for 22 years. It wouldn’t have been possible without your support. I wanna take this opportunity to thank all of you for having prayed for me and wish well for me. I look forward to sharing my experience with you, join me on my facebook so that we both can share this experience and go through this journey together. 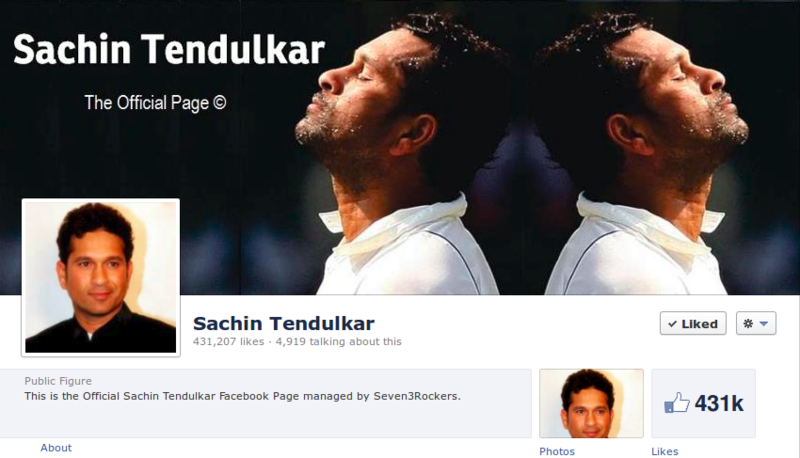 At the time of writing this post, the ‘official’ Sachin Tendulkar page has 4.3 lakh ‘likes’. Previously, the one page every Sachin fan subscribed to was the Sachin Tendulkar Opus which has 7.6 million ‘likes’ and was well maintained. I hope the new ‘official’ page managed by Seven3Rockers is equally good.